It was my birthday, and I was in the mood for finding somewhere new, and in low range. 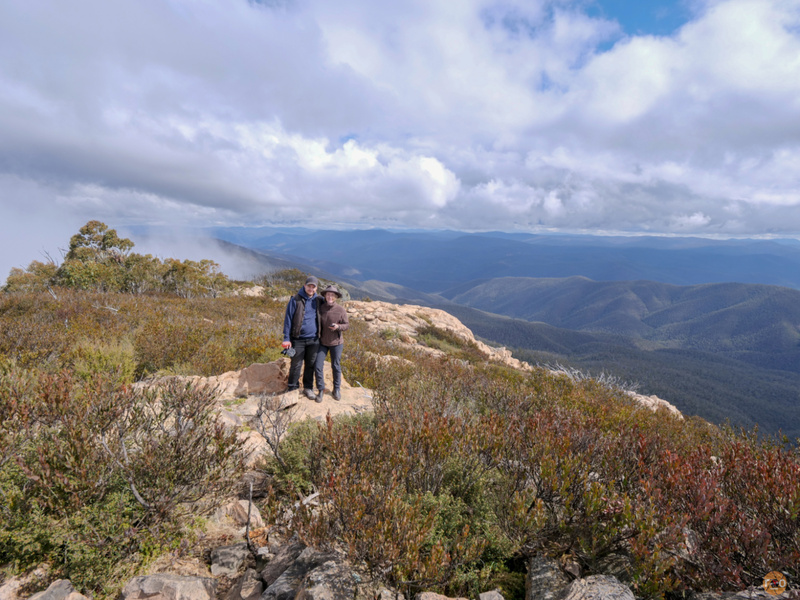 A few hours south of Sydney, or a stone’s throw from Canberra; Brindabella National Park looms, ready for the explorer and escapist alike. 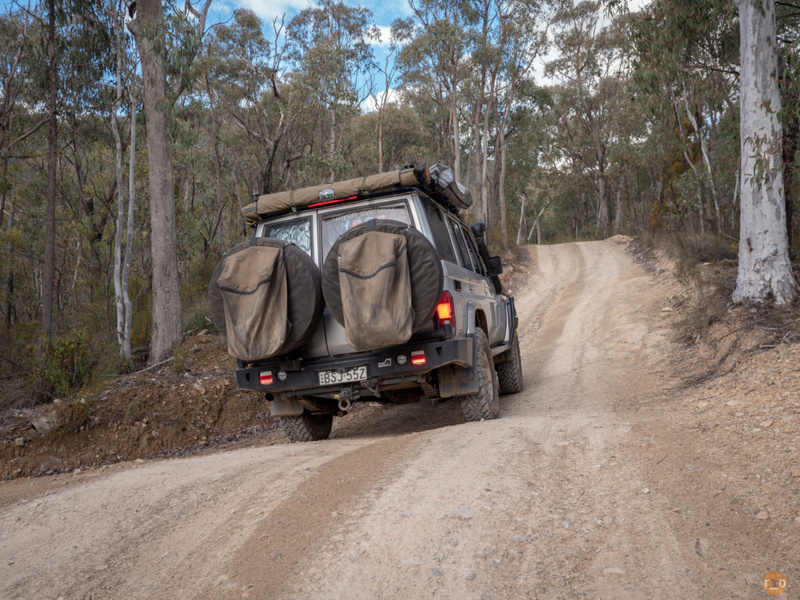 After a sleep in, and cafe breakfast, we slowly packed the LandCruiser and pointed south. By the time we lunched and refuelled in Goulburn it was late afternoon, obviously in no rush. 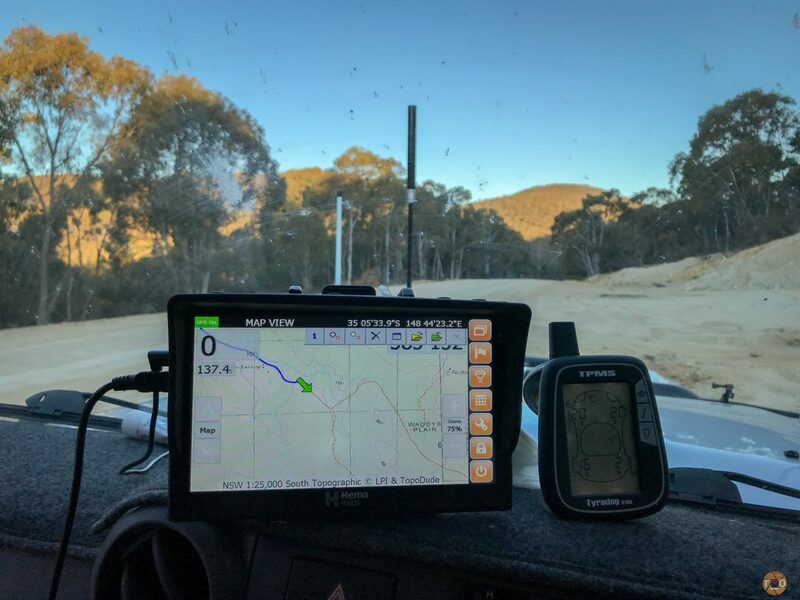 Heading towards Yass, and then Wee Jasper, we travelled through some rather lush looking pastures, the small amounts of rain, and likely the Murrumbidgee River irrigation appeared to be keeping the area sporadically green. 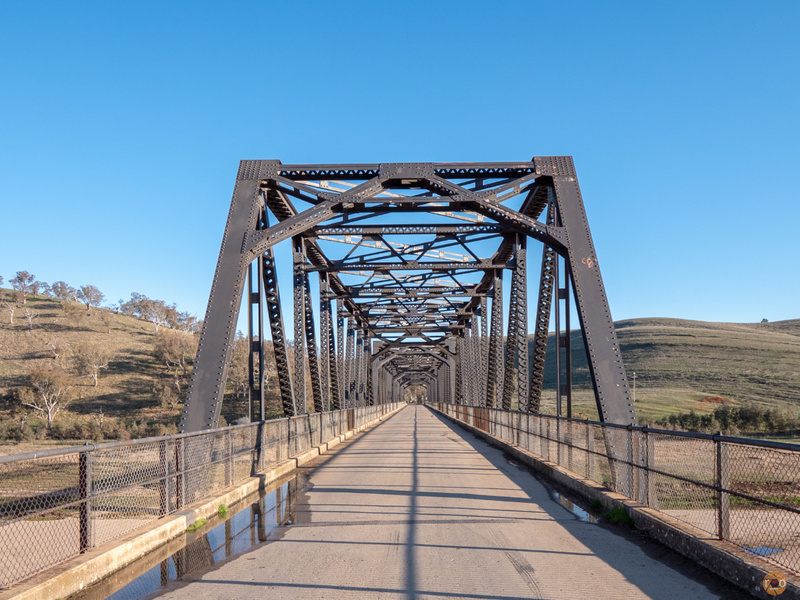 We stopped at the 87 year old Taemus Bridge before winding our way towards the sun kissed mountains we momentarily glimpsed between sheep studded hillocks. 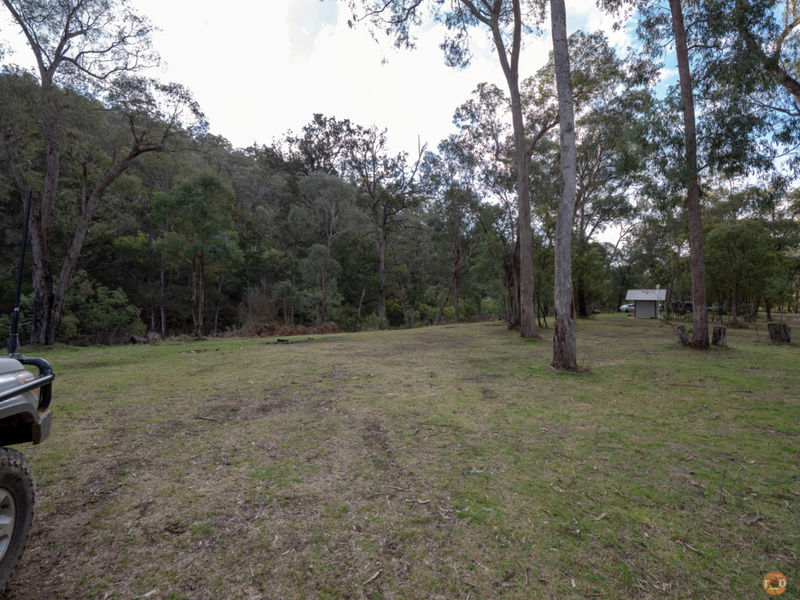 As the gnarled gum trees began to outnumber the fence lines, we wound our way further away from pastoralists to hobbyists and recluse homesteads before they to, disappeared from sight. We were on the Doctors Flat trail. Stopping to let air out of the tyres, the track was powdery white. Keeping an eye on the Hema, we were following this road, looking for the Webbs Ridge Trail. 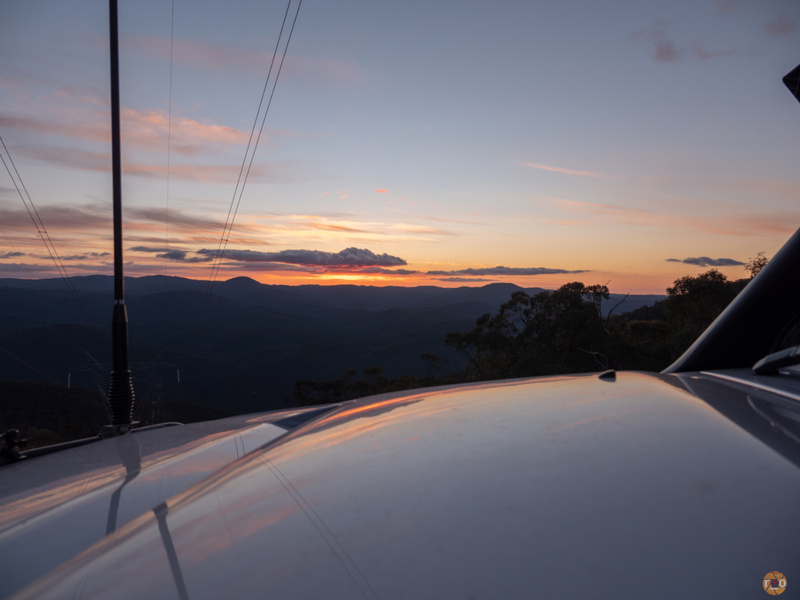 We had decided to avoid Canberra and its peakhour traffic in lieu of a few fire trails. There was a marked campground called Flea Creek that looked suitable enough, with a couple of side track alternatives beforehand. We intended to play it by ear. The track was quite fast, well maintained and has terrific signage. 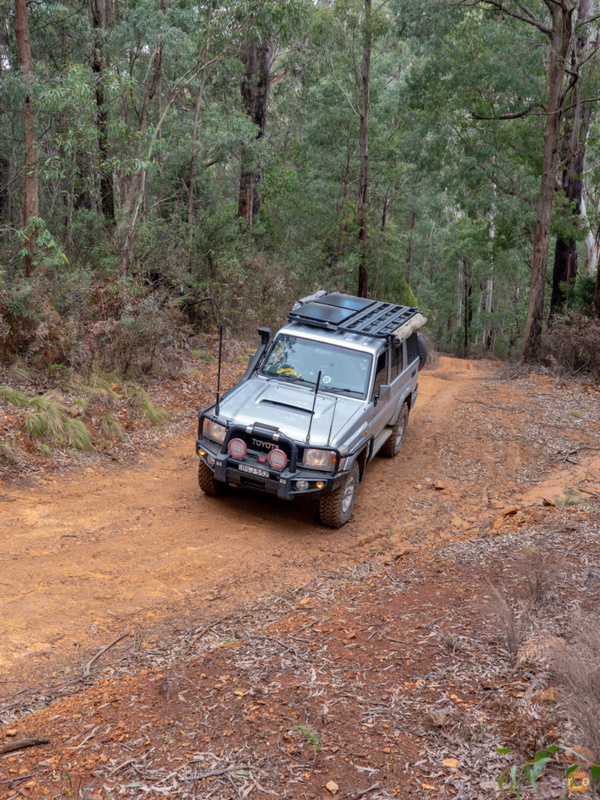 Finding our turn, we ambled along the the Webbs Ridge track. Watching the sun sink beyond the horizon in a firey glow. High beams on, we pushed on. Without the distractions of scenery or the perception of height and mountain ledges, I feel ignorantly brave at night. So we tackled the ups and downs of this track quickly. It twists up and down with only really tree roots and loose scree to negotiate. I like to think that the LED lighting gives me an extra clarified view of the track conditions, but I think its the blackened vignette of the surrounding environment that ensues a sort of confidence. The track grew steeper, and low range slowed our progress. Dipping the bonnet off into the blackness until we tipped and the lights showed the white descent in front of us. There weren’t too many washed out ruts, but there was one, hidden on a steep drop, which loosened our unlocked rear, surging us forward. Given the eLocker was not reliably engaging when switched on, I was not planning on enabling it at all. Growing steeper, and the hairpins more frequent this track was turning into quite the adventure. However, with the faint smell of campfire smoke we rounded the last bend before crossing the creek to the campsite. One solitary camp in situ. The area was soggy but after that trek to get here, we doggedly wandered around to find a spot in the dark. 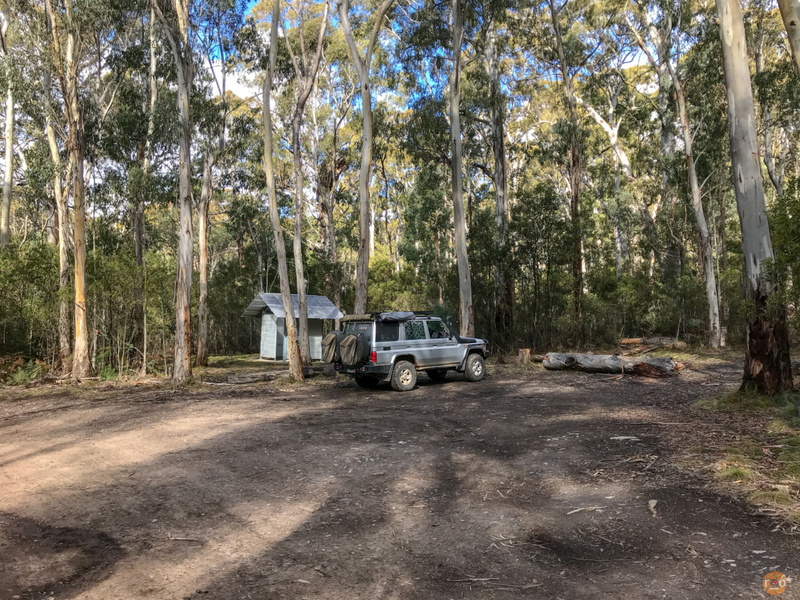 Perched close, overlooking the creek we backed the Oztent into the wattle grove. David tore into a bag of charcoal we had purchased en route, not our usual brand, to find large, cumbersome pieces. However, he managed to get them smouldering in the Uniflame starter. There were plenty of sparks, but far less heat than we were used to. Nonetheless, we were able to cook. We welcomed the warmth after adding timber. The adrenaline of the drive having tempered and now the water front chill had made its way into my clothes. Hot tea in hand, I donned my Drizabone and settled in for some birthday bush telly. I did try out some star photography, but it was late and the Milky Way had sunk behind our canopy of trees. We had some neighbours show up after us, a convoy of four, who had driven past earlier. Upon their return, they set up swags at the other end of the campground. Their bonfire of pallets and foot wide logs cast a fitful light across the gully. They were a little rowdy, but to be honest, we’ve camped next to worse. Their country music mostly drowned out their millennial conversation. Thankfully, they retired early. 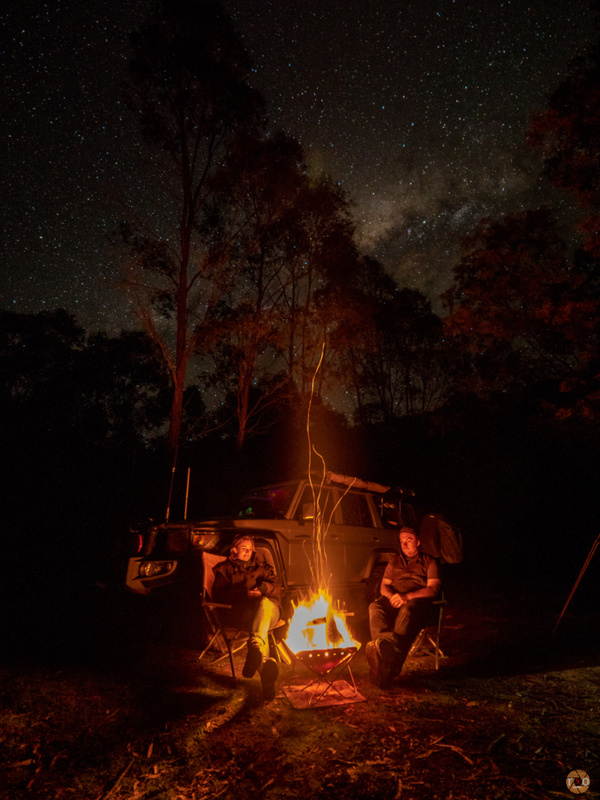 It’s usually a bilateral struggle; going to bed at camp, the warmth of the fire arguing with the promised warmth and comfort of bed. When I have slunk down as low as I can in my chair, dozing occasionally with my chin jammed into my shoulder, the bed eventually wins the argument. Tonight, I roused enough to peel my warm but smokey layers off for bed but then… black. Sleep takes me. I thought it was raining when the light crept into the tent, then I remembered we were on the bank of a creek. Curiosity pulled me out of bed to see what our torchlight had found for us the night before. 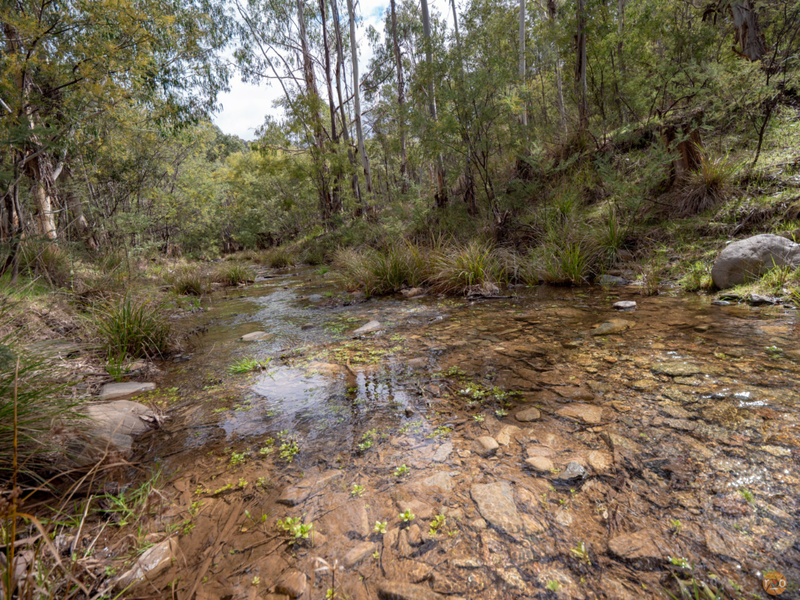 The creek was small, crystal clear but flowing shallow. A picturesque scene. Our neighbours had disappeared, so I explored the length and breadth of the campsite. The toilet is perched high and dry and didn’t smell. 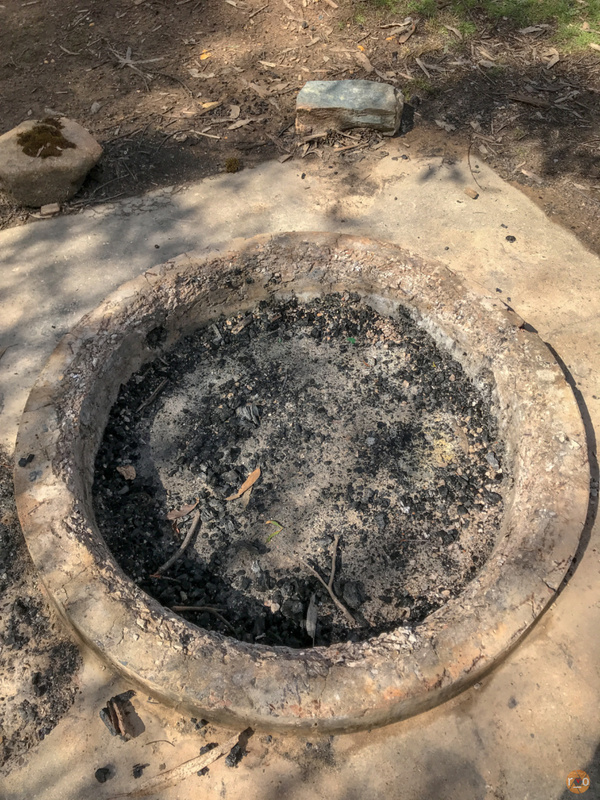 There are designated fire rings with cement surrounds. Unfortunately the traffic and drought has deteriorated the grass of the sites. Someone, Ranger assumed, had left old fence palings and scrap wood by each fire ring, as soggy as it was, this would hopefully deter the unprepared from tearing down or dragging a stump from nearby. Our young neighbours had left theirs smouldering, unsurprising given the size of their fire. I used one of their abandoned water bottles to try and cool off the remains. There was no toilet paper or rubbish aside from the odd bottle cap which was a refreshing sight. The ranger visited and checked the toilet whilst we contemplated breakfast. Porridge and coffee consumed, we packed up camp a little. Despite the threatened rain, we ventured out to explore the surrounding area. 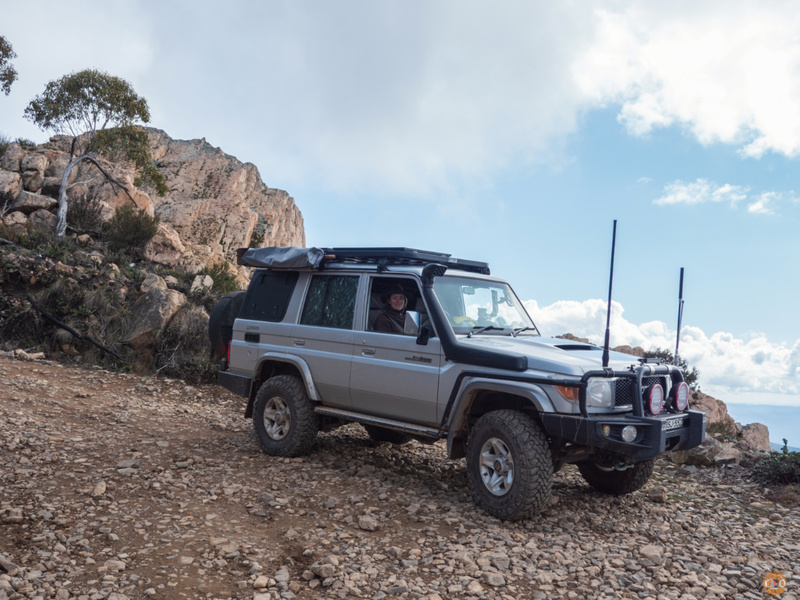 Taking the Gentle Annie Track out of the site, the LandCruiser was forced to warm up at an angle, although shorter, this track is steeper than our entry and we were in first gear low until we let some more air out of the tyres. Using second gear more comfortably, we then found the main road. 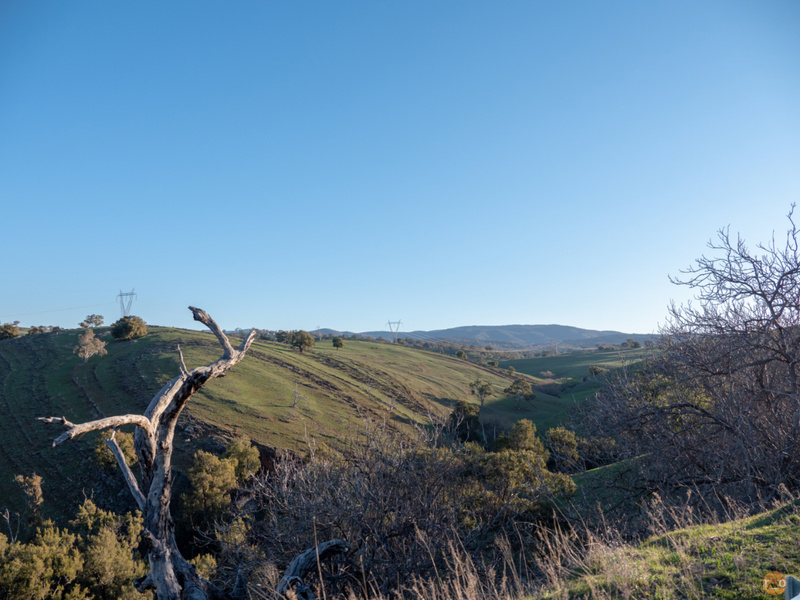 We were struck with how similar the area appeared to the Victorian High Country, the countless hills stretching out around us. The way previous bush fires had left the grey deadwood piercing through the blue-green eucalyptus forest. Heading along Two Sticks Road, an easy two-way road, the cloudy sky descended around us. We were encased in a thick fog. Our plans for a Mount Coree view for lunch would be, minimalist. Nonetheless, we pushed on, slower now with only a few metres of visibility. 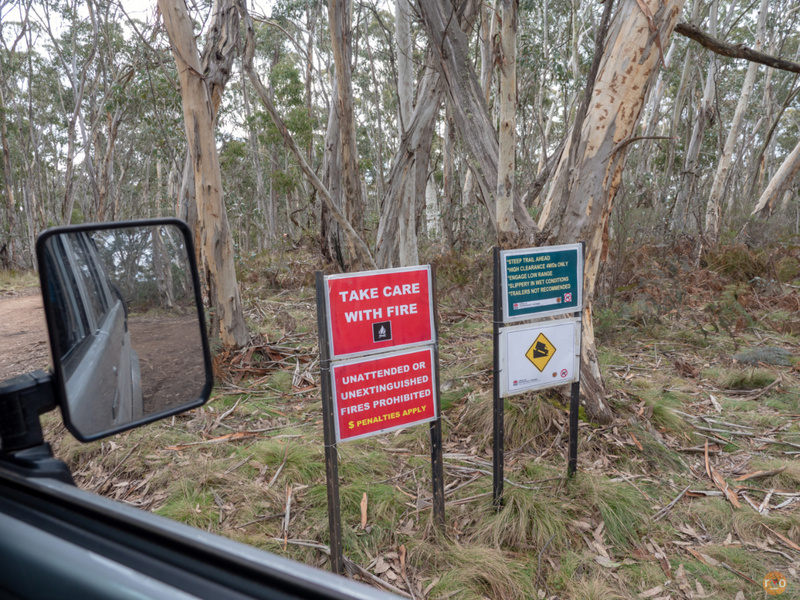 Driving through the picturesque but small campsite at the base of Mount Coree we began our ascent. Sloppy and clay based, it would be interesting with more rain but we climbed without issue, the track is narrow most of the way and there a few steep hairpins. The climax at the top, a striking rocky hairpin, tackled in low first with the trig point dancing in the windscreen. We summited and had the views to ourself for probably half an hour or more before someone appeared. I ate a deliciously ordinary peanut butter sandwich and talked on the phone. My Nana has a sixth sense for calling when we’re somewhere spectacular, so it’s always nice to describe and share our extraordinary view. Our view was neatly split. The fog obscured any view of Canberra. There was a beautiful sounding bird singing for us from deep in the fog, perhaps amplified. After a while a second visitor arrived and we had to carefully manoeuvre the LandCruiser out after having a chat with the day trippers. The descent was easy enough and we passed no other traffic. Continuing on we had a wide circuit in mind and wanted to explore the other campsites. Keeping one eye on the Hema, the bright yellow signs guided us effortlessly to Baldy Range and Dingi Dingi Ridge Trail. 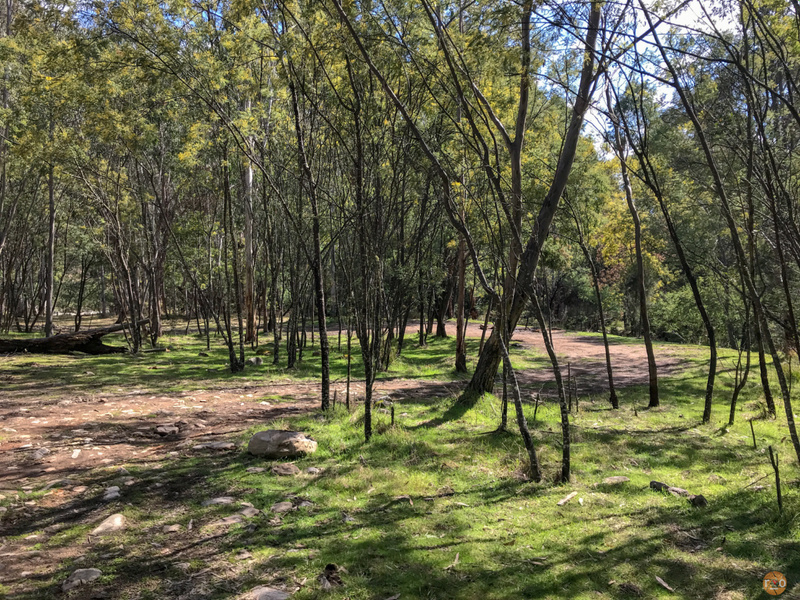 A very pretty track with a mix of chaotic gumtrees, clay and thicker undergrowth. 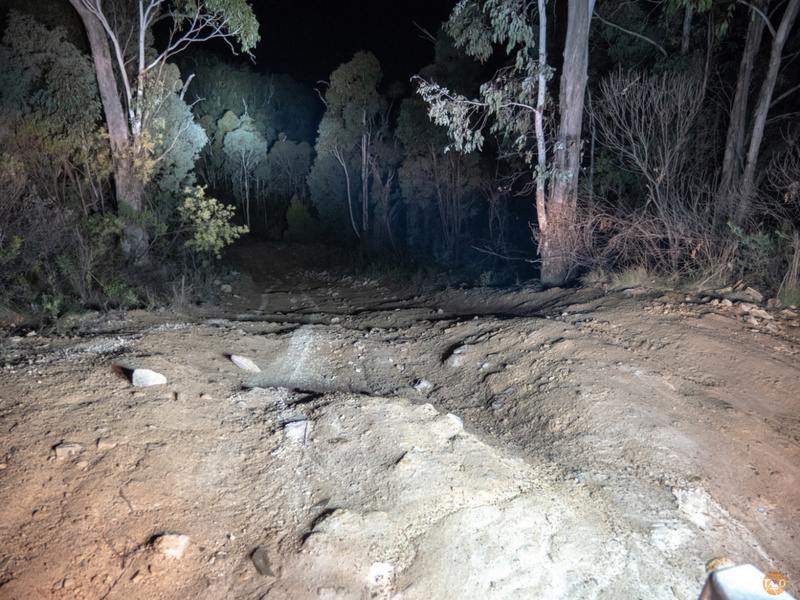 Whilst we did not find any waterfalls, nor any sign of one, Waterfall Track itself fell off the range like one. Down and down and down we went. 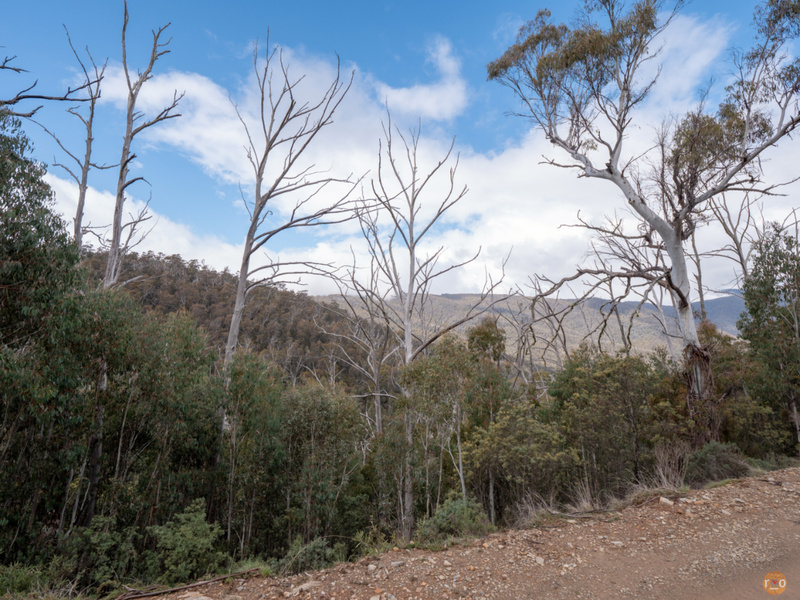 Again, remiscent of the Victorian High Country, the climbs just keep on going. Once on McIntyres Track, these grew ever steeper and we missed our rear eLocker at the final step. A washout lifting one side and surging us forward, an awful feeling, but shortlived once we had all four tyres gripping into the dust. 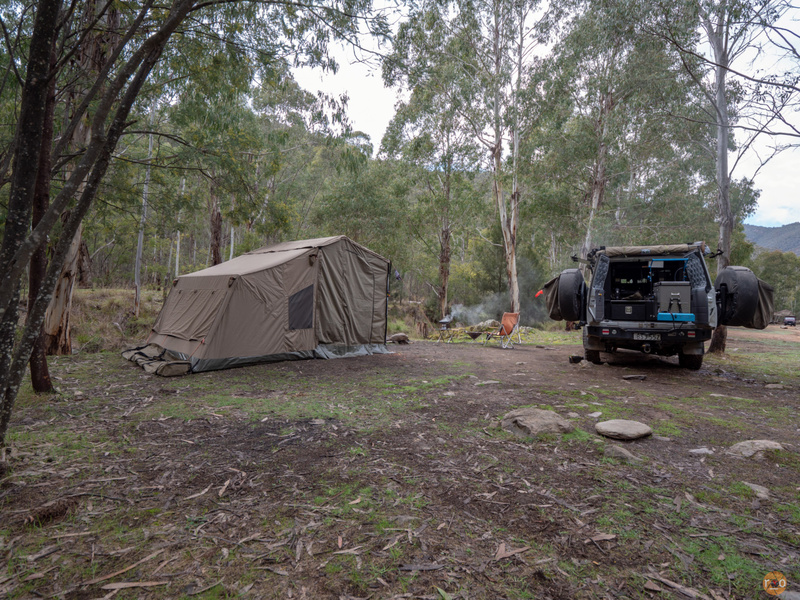 McIntyres Hut Camp would have been an ambitious goal on our late night arrival, however – what a camp! This area is huge by comparison and a green lawn sprawls almost the entire length and breadth of it. By the late hour on Saturday when we arrived, there were half a dozen vehicles, but still a huge amount of space for twice that before we would call it full. 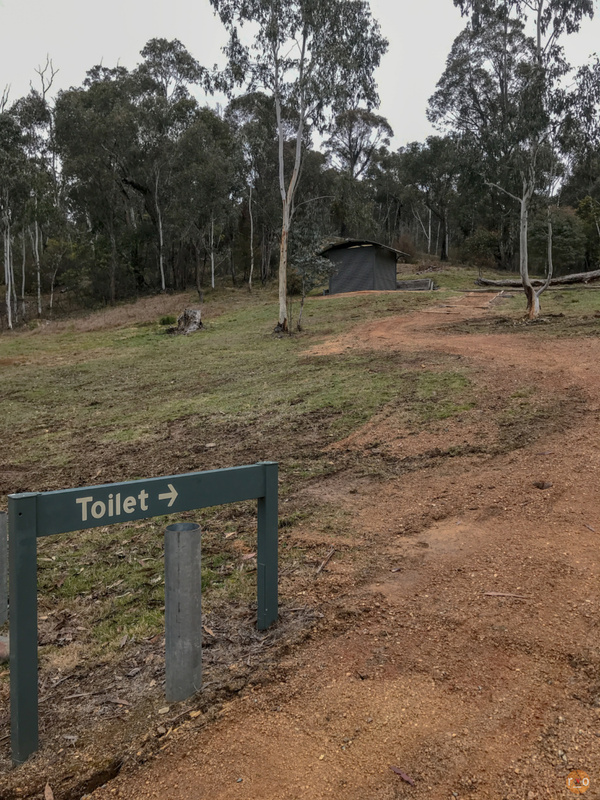 I spied two or three toilets. 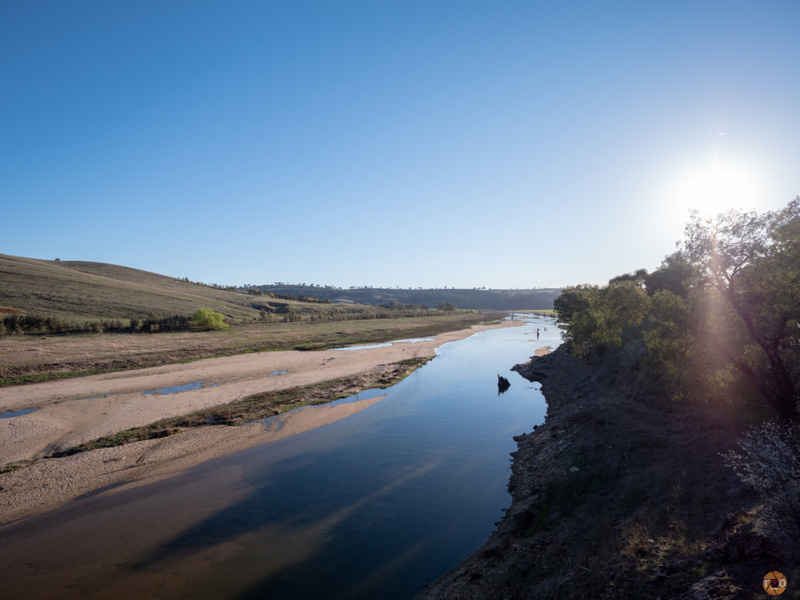 The Goodradigbee River, raging, was a contrast to our ambient trickle. We saw no immediate shoreline or beach but there was a closed off area at one end for repair, the signage describing the alleged reckless damage caused by 4WDs. Across the river was private property and it was apparent this was no longer a throughway. Further exploration and research was required. Dropping a waypoint to revisit, with the tent, we walked around inspecting the area and its Hut with a Ginger Beer. The track to get here was a bit draining, so the sugar was welcomed. Constantly in low range and negotiating hairpins. Perhaps because we knew we had to backtrack, something we always avoid, made it feel longer. But the hour was getting late and without our tent, we had no option but to make our way home. Climbing with the sun on our proverbial back, we eventually made it up McIntyres Track to Waterfall Track. 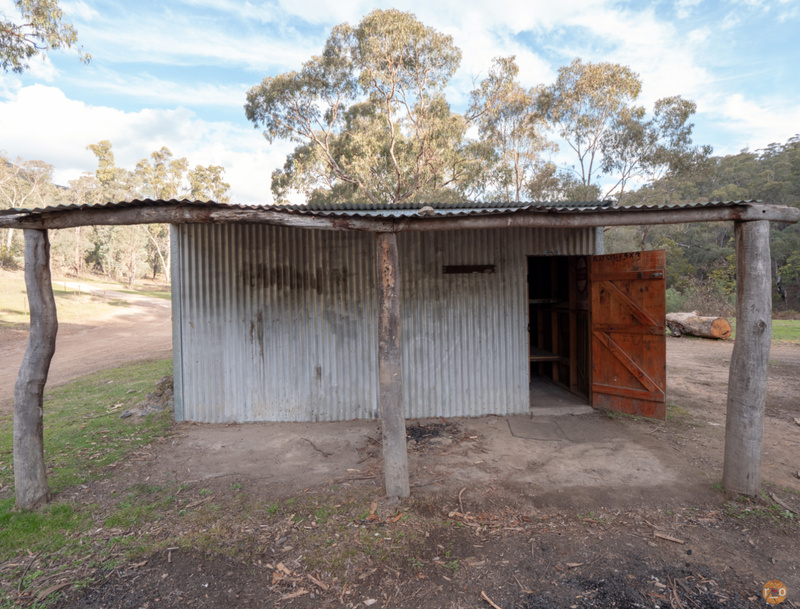 We deferred visiting the Lowells Flat camp as it was a side track off of McIntyres and another dead end. For another day. 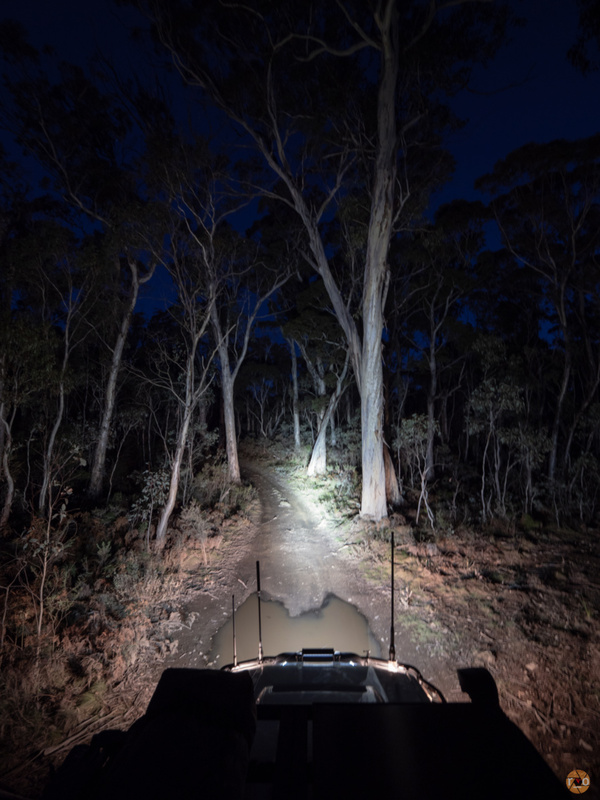 Just like the previous night, although tonight, not totally unexpected, we were descending Webbs Ridge track back to camp in the dark. Although we did enjoy the golden hour elevated in the hills, and found an almost romantic amphitheatre (minus the power lines) to watch the final hooray of the sunset. Trying, or rather hoping, to avoid the washout from the night before, I indeed found it, and we slid in almost identical fashion, but else wise, the descent was harmless. 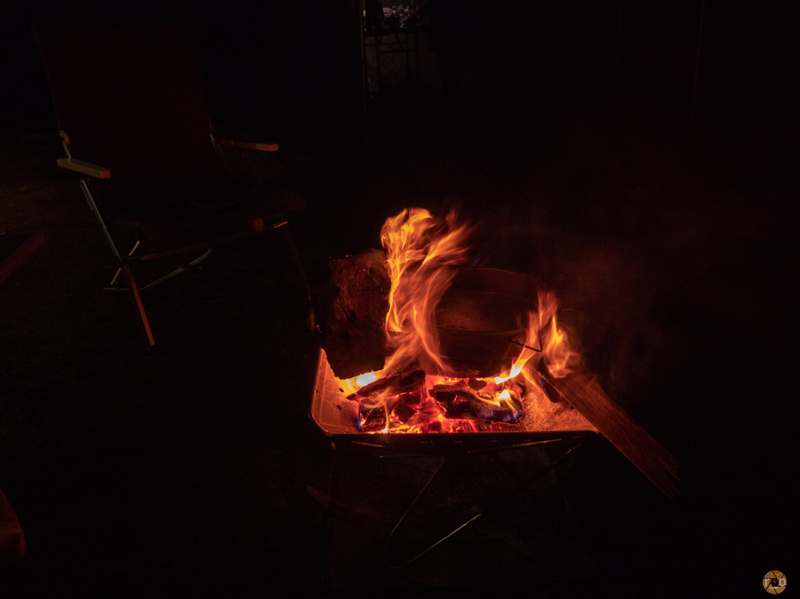 Back at camp, we had the fire pit glowing with wood in minutes. 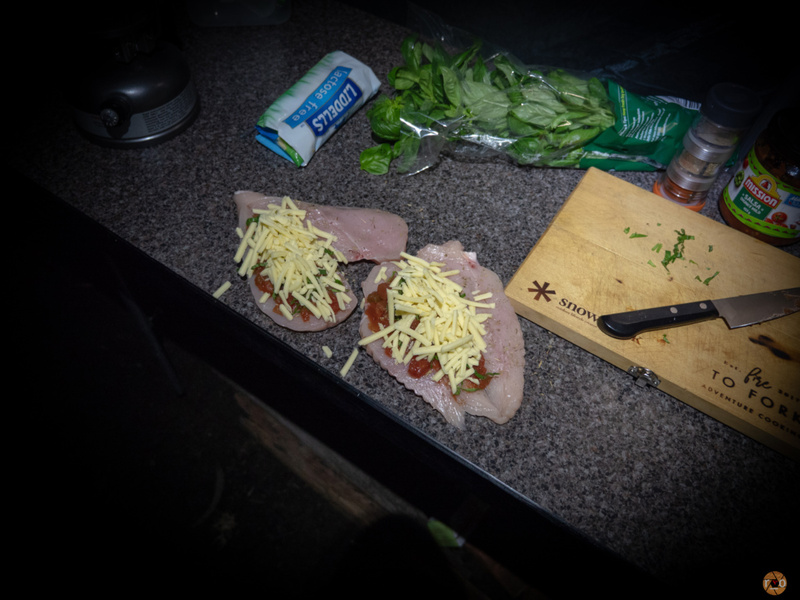 I stuffed some chicken breasts with cheese, spices, fresh basil and the last of our salsa before roasting them in the Bedourie oven on the fire. Partnered with a couple of potatoes in the last of our foil. We had a new neighbour, indicated by a small fire at the other end of the area. Listening to the owls, we tried to spot them in the trees with David’s Fenix, a formidable torch purchased a few years ago, but despite its beam, we didn’t spot any. 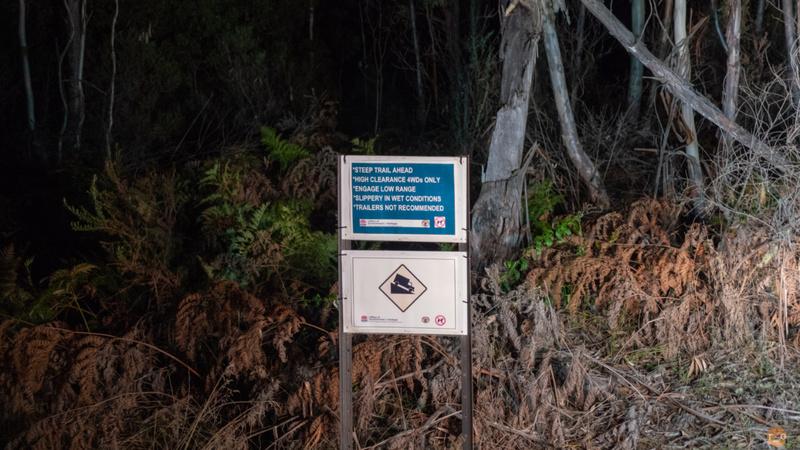 Research tells me they were Boobook Owls, rather than Powerful Owls that the area is famous for. Either way, a forest with owls is a happy forest. 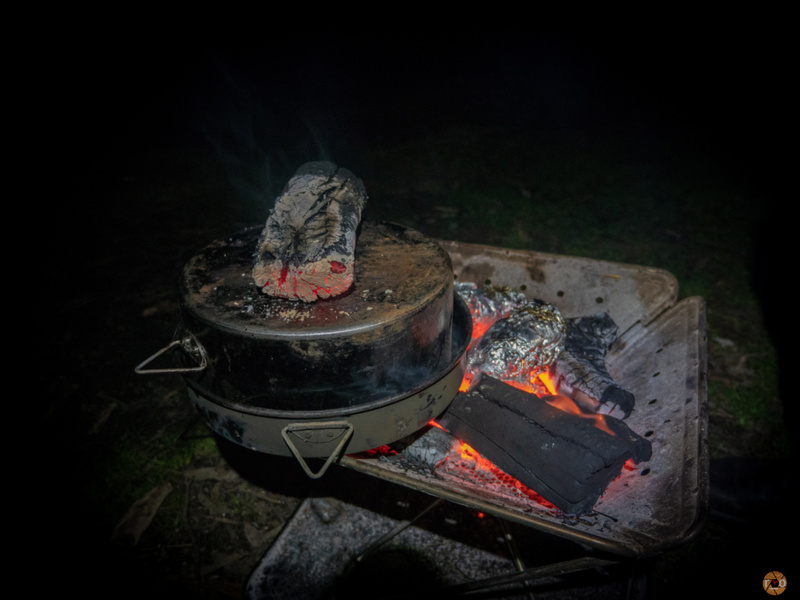 Their calls echoed the crackle of our campfire well into the night. We managed to stay up a little later, burning the rest of our wood and some of the supplied scrap. Digging out a coconut oat bar from the drawers for desert with our cup of tea. I whittled some wood, quietly listening to an audio book. But mostly we just sat, studying the flames. Our conversation sporadic, familiar and random, continued from yesterday, an hour ago or last week. This was a terrific Saturday night. Staring hard out of the windscreen all day had both excited and exhausted us equally. Sunday morning was briefly sunny, so brief in fact, by the time I located my camera and tripod, the clouds had swallowed the sun. We pumped the Coleman and cooked some hamburger patties and eggs. Using the last of our bread and salad greens for a breakfast sandwich. After a couple of hours of nothing. We watched a few 4WDs pass through but mostly listened to the birds and washed our dishes. Slowly packing up and changing into clean clothes. Gearing ourselves up for civilisation. A breeze picked up as we folded the Oztent, blowing in swollen, darker clouds. Before long we were crawling up Gentle Annie once more but we veered left and took the main trail, which disappointedly, took us quickly out of the National Park, through the State Forest and then reclaimed plantation conservation area. 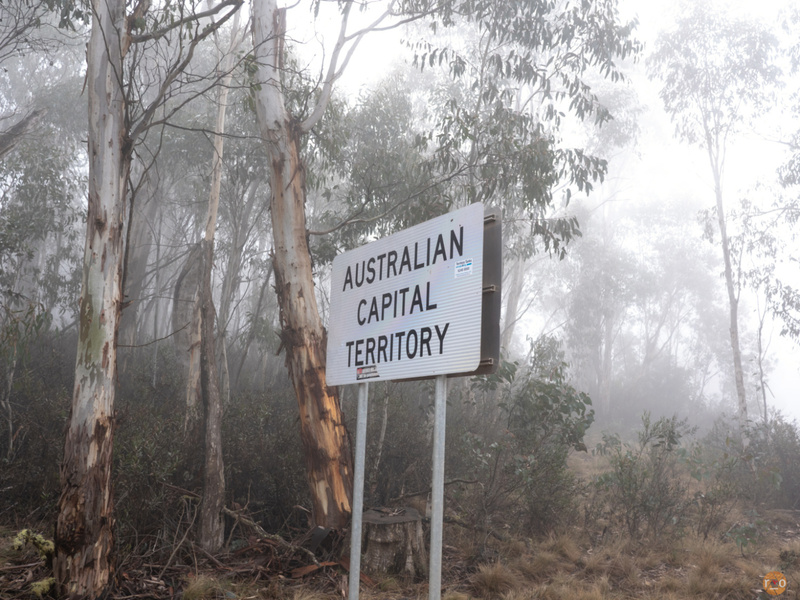 After the Uriarra Crossing, we were thrust into the sprawl of Canberra’s outer suburbs. The way out of Canberra took a bit of concentration but before long we were Northbound. After a rather traditional stop in Goulburn for an early dinner, we were homeward bound. This way would pose a very quick Friday afternoon route to Coree, Flea Creek, or even McIntyre’s Hut (in order of access) as it loops around the bulk of the National Park. Considering we had only explored a couple of tracks, some multiple times. We cannot wait to head back and explore some more. A nice read. Ta for sharing. Ill look to try this when i take receipt of my new Ranger after xmas some time 👏👏. 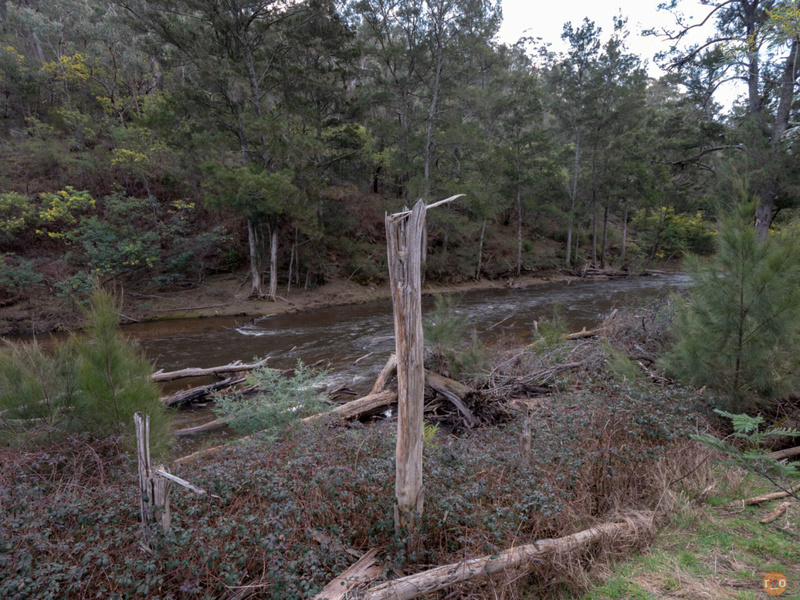 Living in Canberra, this is a stones throw away. Cheers. Thanks heaps! You’re going to love it, hillclimbs for days! Congrats on the new Ranger, It will look good with Brindabella dust on it.